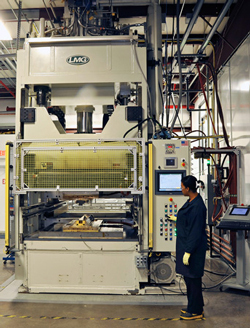 Tri-Mack’s Advanced Composites Center is a state-of-the-art production facility dedicated to the processing of thermoplastic composites (TPCs). Using NADCAP and industry best-practices, our facility and manufacturing processes are engineered to produce high quality components. Thermoplastic composites are continuous fiber reinforced materials with exceptional mechanical properties. Our process starts with prepreg tape or fabric consisting of carbon, glass or aramid fibers impregnated with polymers such as PEEK, PPS, PEI and PA. In the Advanced Composites Center, we process the prepreg into sheets and thermoformed shapes. The consolidated shapes are water jet or CNC machined into finished parts, or combined with injection molding to produce hybrids. With mechanical properties up to 10x those of injection molded thermoplastics, thermoplastic composites can offer significant weight savings when replacing metallic components – up to 70% vs. stainless steel. These very stiff materials perform well in high vibration environments and exhibit excellent toughness when compared to traditional thermoset composites. Thermoplastic composites also offer a cost advantage when compared to traditional thermosets. Thermoplastic composites can be manufactured more efficiently without the need for freezer storage, hand layup, autoclaves and lengthy cure times. 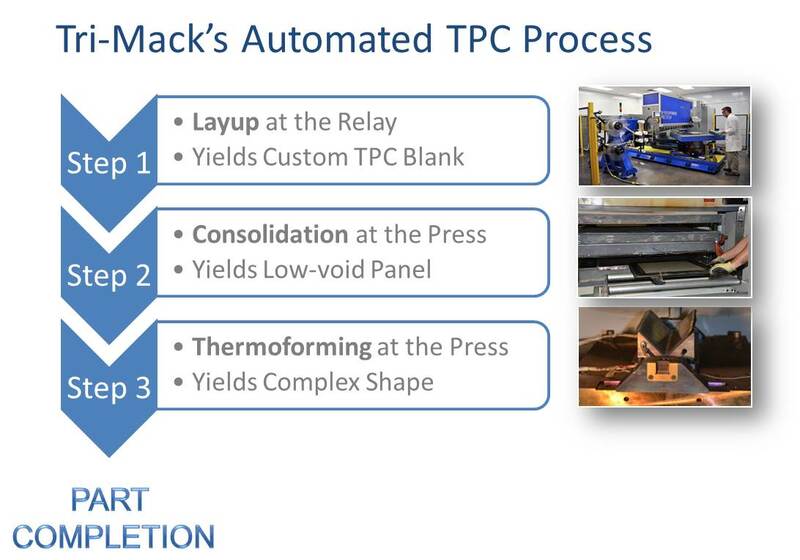 Tri-Mack’s thermoplastic composite manufacturing consists of three automated processes: Lay Up, Consolidation and Forming. 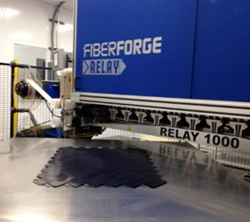 Tri-Mack’s Advanced Composites Center features a Fiberforge RELAY 1000 for the automated lay up of continuous fiber reinforced prepregs. The unidirectional prepreg is supplied as rolls of tape and the RELAY provides high speed lay up – over 2.5 meters of tape per minute. The RELAY uses a rotating vacuum table, ultrasonic welders and CNC control to ensure accurate course placement and ply orientation. With the RELAY we have the flexibility to orient and place material where it is needed, enabling us to optimize part design, producibility and material usage. Tri-Mack’s RELAY 1000 can also run two different materials simultaneously and produce tailored blanks up to 1 m². Our consolidation process uses heat and pressure to transform tailored blanks into low-void panels. 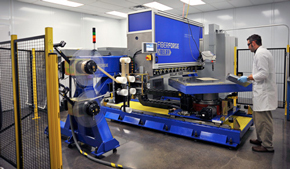 Tri-Mack’s custom-designed 500 ton down-acting press is outfitted to process high temperature thermoplastic composites. Our consolidation cell is designed for accuracy and repeatability, and features processing data collection. Tri-Mack’s custom infrared oven and high speed shuttle are used with the 500 ton press to thermoform panels into complex shapes. The shuttle transports consolidated thermoplastic composite blanks through the IR oven for heating and into the mold for forming. Shapes are accurately produced using precision molds designed and built by Tri-Mack. To ensure the quality of our thermoplastic composite components, we conduct NDT on our consolidated and formed shapes using an Olympus ultrasonic scanner. Design stronger, lighter components with Tri-Mack’s custom Hybrid Molding solutions. Learn more here.